One of our loyal PhoneArena readers sent us a screenshot revealing that the first-generation Motorola Moto X is about undergo a soak test for an unnamed software update. These soak tests are usually done to a limited number of devices whose owners belong to the Motorola Feedback Network. By conducting the soak test, Motorola can see if there are glitches that need to be tweaked on a software update, before it is released to all users with that particular phone. This soak test could be for a maintenance update designed to prevent the treacherous Stagefright vulnerability from infiltrating the OG Moto X, and taking over control of your camera, microphone and stealing some of your content. We would be flabbergasted, to say the least, if this was for Android 6.0 Marshmallow. After all, the older dual-core chipset in the handset delayed the update to Lollipop. Besides, there are a lot more newer models that should receive Android 6.0 first. 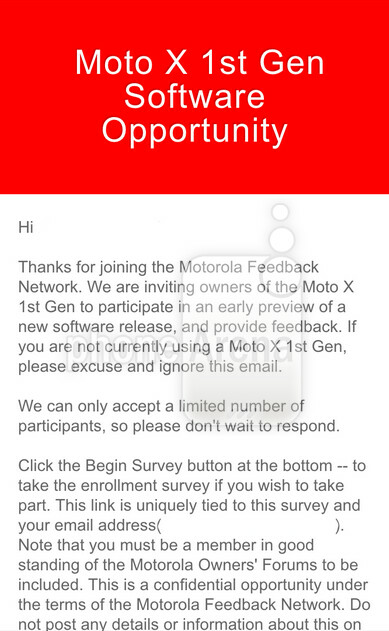 To take part in future soak tests, make sure that you are a member of the Motorola Feedback Network. One condition that they place on those joining is one of confidentiality. You are not allowed to tell the media anything about the tests at all. If you can handle that, and understand that you are assuming a risk by testing a unreleased software build, you can visit the Motorola Owners' Forum to sign up. So, you said that "One condition that they place on those joining is one of confidentiality. You are not allowed to tell the media anything about the tests at all." And at last you said "Thanks for the tip, David!" I hope there is many people in that group called David . Which Moto X is it? Unlocked or carrier variant? The Verizon Moto X still hasn't gotten Lollipop yet. I think I gave up on Verizon updating my 2013 Moto X. I'm getting the Moto X Pure and giving Verizon the finger as soon as my contract is up. I've actually given the Motorola Nexus 6 a lot of thought. It's an awesome phone, especially for that price, but it's already a year old and that means a year of support lost over the Moto X Pure, it also has a 32 bit processor with fewer cores, no expandable storage, and does not have the Motorola custom software that I've grown to love. As much as I love stock Android, it just feels like it's missing features without the Motorola enhancements. I've given up on the Droid Maxx. If the 2013 Moto X isn't getting it, I'm sure as hell not. It's an awesome phone with amazing battery life, but KitKat is old. I already ordered my GS6, it's on the way. I had hoped to get another Motorola device because of the lack of a skin, but the Pure is way too big, the Play isn't available in the States, and I couldn't wait for the Turbo 2. The S6 with the stock theme isn't bad, and even though it's a Verizon branded Samsung device, it'll still get better updates than my old 2013 Droid. I'm sure the soak test is for Lollipop on Verizon. I think that you might still get it for your Droid... though I doubt that you care now that you've ordered your GS6. I'm sort of in the same boat, but I couldn't go GS6 because of the battery life disparity. I'd love to have a better camera and a denser screen, but I haven't come across that perfect combination of size, battery, camera, display, and UI yet. So I'll stick with the Maxx, updates or no. At least 4.4.4 is stable. It's not like the S6 has bad battery life, it's just average. I'm ready to give up the outstanding battery life for a device with up to date software/hardware and predictable updates. If that means ending the day with 10% instead of 50%, so be it. I thought the Moto X Play would be perfect for me, but they didn't release it unlocked in the States and I don't trust Verizon with updates to the Droid brand anymore. Samsung may take longer to get updates out, but at least they have a bit more weight with Verizon to make them hurry up with the approval process. I thought there was a clear difference between a Soak Test and a Beta Test. Seriously, Alan F? This is how ridiculous rumors start. Implying that this could even be related to Marshmallow 6.0 is either woefully ignorant about how Android rollouts work, or irresponsible tech journalism. People who don't know better come to these blogs to learn. I apologize for coming off harsh, but I was "flabbergasted" just reading this.